Guitar maestro Joe Satriani has toured Australia many times and was last here in 2014 on the back of Unstoppable Momentum. Constantly touring the world, Joe was finally back down under in support of this year’s stellar release What Happens Next. His band on this occasion included the masterful Bryan Beller on bass, the formidable Joe Travers on drums and the incredibly multi-talented Mike Keneally on keyboards, rhythm and additional lead guitars. The show was split into two acts with no support so it was a feast of guitar right from the start. The first set kicked off with the band members taking up their spots, Satriani soon following in this sunglasses, black jeans and t-shirt and super cool, silver reflective Ibanez signature guitar attached to two operating Marshalls heads by an old school guitar lead. It’s a simple and effective look enhanced with his shaved head and is how fans have known him to look for around two decades now. Beginning the show, ‘Energy’ set things off, accompanied by visuals of racing traffic as Joe let loose with one of the smoothest and best sounding rock guitar tones to ever bounce off the walls of the State Theatre. Expressive from the first song, his dextrous guitar playing saw moments of full body movements as he launched himself into the odd wild string bend or screaming harmonics with his signature fretting hand swapping technique and controlling the whammy bar with his left hand perfectly as double bass drumming hammered along with the bass. Two more tracks from the latest album were played which bookended the classic track ‘Satch Boogie’ from the breakthrough instrumental guitar album Surfing with the Alien. During that batch of songs, the bass grooving ‘Catbot’ included some great fingerpicking bass playing whilst Satriani added flurries of pick scrapes and played licks with his teeth and Keneally sustained his rhythm guitar parts to effectively play some keyboard parts simultaneously. Of course, ‘Satch Boogie’ was a ripping shred and blues number with blasts of bass drumming, a renowned finger tapping sequence and stacks of screaming harmonics during the outro solo. By comparison, ‘Cherry blossoms’ saw a change of guitar with some funky graphic artwork, relevant projected visuals and guitar lines synchronising with the keyboard lines before some fast guitar shredding with some outside notes but done tastefully as only guitarists of Satriani’s calibre can deliver. Another fan favourite came with ‘Flying in a Blue Dream’ and had Satriani using a bright red newer signature guitar, coaxing searing but musical feedback from beautifully sustain notes as science fiction based visuals added flair to his wah and delay effects enhanced legato soloing. The next three tracks still offered plenty of guitar solos but the rhythm section locked in some thumping and heavier rhythms especially during ‘Thunder High on the Mountain’ whilst ‘Ceremony’ and ‘Cataclysmic’ also showed off the lighting design of tonight’s show with purple, red, blue and green down lighting versus a white spot light on Satriani as he peeled off guitar lines with frightening ease. The first set closing track ‘Ice 9’ from Surfing with the Alien included a bass solo from Beller and a trade-off between Satriani and Keneally with the former adding in some interesting guitar effects done with his hands including a ray gun type effect and the ‘lizard down the throat’ effect by sliding the fretting hand up the guitar neck whilst lowering the whammy bar. The song’s main guitar solo is almost a reverse delay, Hendrix tribute that simply flies by with blinding speed. After a brief interlude, the second set began with a cover of Santo and Johnny’s ‘Sleepwalk’ which provided a gentle and melodic easing back into proceedings. 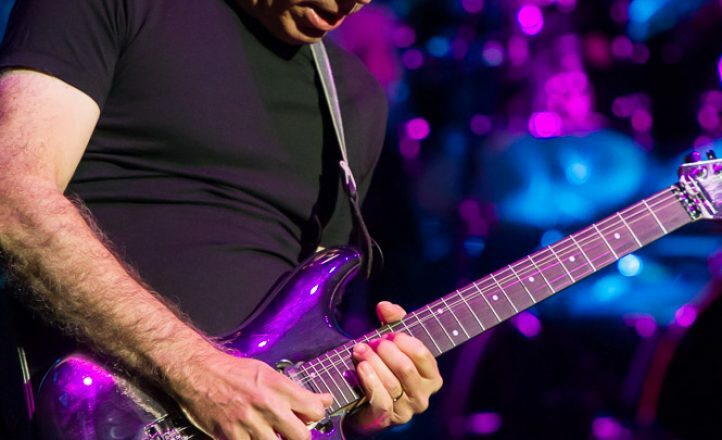 Following suit with ‘Cool #9’, Satriani prowled the stage, moving with the beat as both himself and Beller were both spot lit, leading the song’s groove. It was a show highlight in dynamics, pace and musicianship. The song then changed pace with a fiery guitar solo including high pitched whammy pedal notes and sweeping speed runs were let rip by Satriani against strong drumming. It segued well into the heavy rock boogie of ‘Headrush’ followed by a well-lit drum solo section by Travers chock full of reverse fills and a quick reference to Van Halen’s ‘Hot for Teacher’. A change of pace then came with the title track from What Happens Next and saw Satriani return to his reflective silver guitar with some subtle delay effects. A jam with Keneally followed offering up some fast call and response moments plus deft use of volume swells before the cool, somewhat malleable riff of ‘Super Funky Badass’ followed just like the latest album’s track listing. It is a great, simple rolling riff which synchronises with the drums to then morph into tasty guitar harmony sections between Satriani and Keneally. Adding key changes, some golden tendrils visuals, more dual guitar soloing and some wild whammy bar dips from Satriani made this song another set highlight. The hit single which brought Satriani to a mainstream audience, ‘Always with Me, Always with You’, was next and with Satriani’s sustained tone and a judicious use of gain, the melodicism shone throughout. Visuals of clouds racing added to the floating wistfulness of the song with subtle variations in the track’s performance from Satriani. To close off the main set, a swift ‘Summer Song’ saw Satriani again using his red guitar as the opening harmonics riff and filtered promotional video clip from 1992 added to the fun vibe, completing the song with an array of hand slides and whacky noises to standing audience applause in the luxurious and historic seated venue. Encore time hit and with that, ‘Crowd Chant’ was an apt, energetic song with Beller running around encouraging hand claps as Satriani pumped out the riff to then lead the audience into the interactive call and response sections as they sang back his guitar lines. As the song progressed, the band were then perfectly synchronised in delivering the song as the rhythm parts were effortlessly executed. The closing track and absolute highlight for the night was naturally the opening title track from Surfing with the Alien with tonight’s performance this time embellished with some excellent animations of the Marvel Comics Silver Surfer character from the album’s artwork in action. Satriani’s wah filtered guitar sound and rapid guitar solos with whammy dips and expressive outro soloing. Flowing straight into a blues guitar jam kept the incendiary soloing going before Satriani and the jubilant band ended the night with open chords, reverse whammy chirps and hand slides all over the guitar, including behind the guitar nut. The man is a freak of musical genius; an all seeing, all knowing guru of the electric guitar. Without doubt, tonight’s show was one of the best live performances from Satriani yet. Satch simply gets better with every tour and if you’re a guitar head, this was the show of the year and truly an astonishing concert.